Anyone who reads this column regularly knows I am not the biggest fan of the way technology is taking over our lives. I relish the ease with which it keeps me abreast of what’s happening in the world, and enriches and expands my perspectives; I am also experienced enough to know which sources to trust, and which to be wary of. But my reservations about the invasive power of tech are confirmed by every story that underlines how those who are in possession of our data – and most skilled at harvesting our opinions and contact books – are not acting in our best interest. Initially fascinated by the multidisciplinary landscapes of digital tech blending with art, science and design, I have ended up avoiding those exhibitions and events which seem intent on celebrating the very tools and technologies most complicit in separating us from the reality we so clearly need to engage with MORE, not less. And then I visited the Liquid Crystal Display exhibition at Sheffield’s newly reopened Site Gallery. The Site gallery has been in Sheffield for nearly 40 years (next year is its 40th birthday), but has been closed for the past two while architecture practice DRDH masterminds its expansion, trebling its exhibition space, and adding education rooms and a really excellent cafe run by a local co-operative (try the tahini and rosewater cake and you won’t regret it). Content has also evolved: still celebrating new and emerging artists, where its programme previously focused on photography, it is now dedicated to new media, moving image and performance. Under the stewardship of artistic director Sharna Jackson, previously at Tate Modern, there are promising indications that this will be a more nuanced approach than the bandwagon-jumping Instagram-oriented digital wizardry that many mainstream galleries have been indulging in of late. Its first exhibition, curated by Laura Sillars with Angelica Sule, explores our relationship between today’s liquid crystal technology – the crystal elements that flow under our smartphones, computers, cameras and TVs, illuminated with seductive sharpness and clarity by light-emitting diodes – as part of a long human fascination with the physical, spiritual, scientific and tactile properties of rock crystal. Set within a ‘cabinet of curiosities’ framework designed by artist Anna Barham, the 16 artworks exhibited steer clear of easy, instantaneous distraction. Moving image is used sparingly and judiciously. For example, there is gloriously grainy footage of Jennifer West’s experiments with film (burying it over periods of years and distorting it with chemicals so that the film itself becomes a kind of archaeological/geological relic). We are also encouraged to sit down on a sofa in a darkened pod to engage with a really absorbing film by The Otolith Group, called Anathema, which reveals how easily our emotions engage with what we see on screen; I arrive in the film at a point where an outsized finger is caressing the bare shoulder of a tiny sleeping woman, who seems to be responding positively (panning back, the camera shows us that this is someone stroking the image of a woman on a small screen). There are really interesting juxtapositions of physical objects, including a chunk of sparkling white crystal, whose delicate striations appear to be drawing white paint from the nearby canvas (Karen David’s Apophyllite VI). There is a really funny work by Shimabuku: in a white display cabinet, he has paired several slim, lozenge-shaped Paleolithic rocks, possibly tools, with similar sized but defunct smartphones and iPads; dead technologies separated by millennia. The work is called artwork Oldest and Newest Tools of Human Beings. There is also a decorative display of assorted crystals from a collection curated by the legendary Victorian writer and philanthropist, John Ruskin. Famously concerned at the impact of industrialisation on man’s relationship with nature, Ruskin founded the Guild of St George, through which he established a museum for the working men of Sheffield so they could learn about the beauties of the world around them. Most of the crystals from these collections came from local mines. Mining is also on the menu in a film by Lisa Autogena & Joshua Portway (called Kuannersuit: Kvanefel). It reports on a dilemma facing a community on the southern Greenland island of Narsaq. Located next to one of the richest rare earth mineral resource deposits in the world, and one of the largest sources of uranium, the mostly indigenous islanders are interviewed on the prospects of their land being sold to foreign mining companies; they like the thought of financial prosperity, but quail at the prospect of selling out. The film works on many levels; provoking questions about how the very bedrock of our lives – our transactions and interactions with friends, family, banks and businesses – is being sold from under our feet, mostly in order to boost corporate profits. 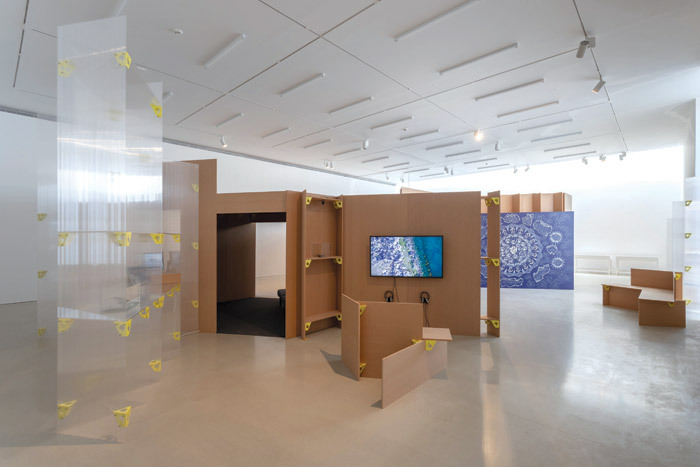 Jackson has an ambitious programme for increasing engagement – especially among demographics that rarely frequent art galleries – and perhaps this is part of the qualitative difference I sense: she sees new technology as a tool for meaningful interaction, a spark for conversation, rather than a destination in itself. But the last word goes to curator Sillars. In the exhibition programme she reflects on the particular allure of liquid crystal technology: ‘defined by its lucid, liquid visuality’, it ‘draws us into an augmented sense of newness’. She concludes: ‘Revealing the image as a product of the physical world of matter breaks the flow of glowing light and connects us to an older, mineral world of objects that will outlive our human, now-craving lives.’ In the increasing lust for newness, maybe old is the new black. Liquid Crystal Display is on at Sheffield’s Site Gallery until 27 January.